Sofia Duarte from DTU presented the EFFORT project at the Nordic One Health conference, in Friibergh, Sweden, 19-20 of March. The conference was organized by One Health Sweden, a national intellectual platform where veterinarians, physicians, molecular biologists, ecologists and environmental chemists with an interest in zoonotic infections interact and create synergies. It involves several Swedish universities and governmental organizations. A few invited key-note speakers from foreign countries, mainly from Scandinavia, were present at the conference. Robert Skov from Statens Seruminstitut, Denmark, Merete Hofshagen from Norwegian Veterinary Institute, Antti Oksanen from Finnish Food Safety Authority Evira and Roel Coutinho, from University of Utrecht, The Netherlands. The latter presented the 3rd International One Health Congress Amsterdam 2015, which overall theme will be Prevention at the source. Presentations with a focus on antimicrobial resistance were given by Josef Järhult from Uppsala University Hospital (Antimicrobial resistance in the environment), Jakob Ottoson from Swedish University of Agricultural Sciences (Bivalves as reservoirs of antibiotic resistance in the environment), Stefan Börjesson from National Veterinary Institute (High occurrence of E. coli producing ESBL and pAmpC in Swedish broiler production despite minimal usage of antimicrobials and limited overlap with human clinical isolates) and Robert Skov (Livestock- an important reservoir for resistance?). All presentations are available on the meeting website. 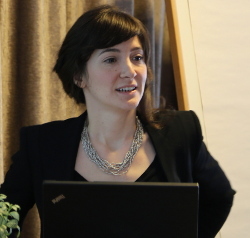 Sofia Duarte presented the EFFORT project, with a summarized description of each work package, thus providing an overview of the scientific core of the project. Reactions to the project goals were positive as the outputs of EFFORT may be of interest to several researchers who integrate One Health Sweden. The challenge of articulating different work packages during the project was highlighted by the chairperson Lotta Berg. Several attendees were interested on further information on to what extent AMR human data will be collected.